While there is no cure for diabetes, new treatment options are achieving notable success improving insulin production via stem cell therapy and cell-identity switching. Diabetes mellitus is a group of metabolic disorders in which a patient has higher-than-normal blood sugar levels for prolonged periods. If left untreated, diabetes can cause a plethora of harmful secondary conditions. According to the latest reports from the World Health Organization (WHO), 422 million adults over the age of 18 have one form of diabetes and 1.6 million deaths per year are attributed to the disease1. There are three types of diabetes: type I (T1D), type II (T2D), and gestational. In any form of diabetes, there is a fundamental problem with the levels of insulin produced by the pancreas and an inability for the body to recognize the presence of insulin. Insulin is an essential peptide hormone that maintains normal blood sugar levels. It also aids in the uptake of glucose by cells, regulates carbohydrate, lipid, and protein metabolism, and promotes cell division and growth through insulin responsive substrate (IRS) signaling proteins2. In T1D, the immune system attacks and destroys the majority of pancreatic β-cells, thereby preventing them from producing insulin. This condition has frequently been referred to as "juvenile diabetes" and there is no known cause or established cure. However, in T2D, which is known as acquired diabetes, the body has become resistant to the effects of insulin and pancreatic β-cells frequently under-produce the hormone. This results in a gradual progression of symptoms such as increased thirst, frequent urination, fatigue, blurred vision, slow-healing sores, and unintended weight loss. If left untreated, T2D can cause various types of heart disease, kidney damage, blindness, and limb amputation due to nonhealing diabetic foot ulcers3,4. T2D is more commonly adult-onset and due to lifestyle factors, such as obesity and poor health. In fact, there are so many new cases of T2D each year that the Centers for Disease Control and Prevention has issued a public health notice, urging visitors who search for facts about the disease to take a one-minute quiz to determine their risk for becoming pre-diabetic. In the US, T2D comprises roughly 90-95% of all diabetics. Only 5-10% of patients suffering from diabetes have T1D or gestational diabetes5. Gestational diabetes is the third form of diabetes mellitus and can occur in pregnant women who have never had diabetes. Although this condition usually subsides after the birth of the child, it can cause detrimental effects to both the health of the infant in the womb as well as the mother6. While more treatment options are needed for all forms of diabetes, this review will highlight recent advancements in the treatment of T1D with stem cell therapies and cellular reprogramming. There is no cure for diabetes. The most common treatments currently in use for T1D are blood sugar level monitoring and corresponding insulin injections, which are sometimes required three to four times per day7. 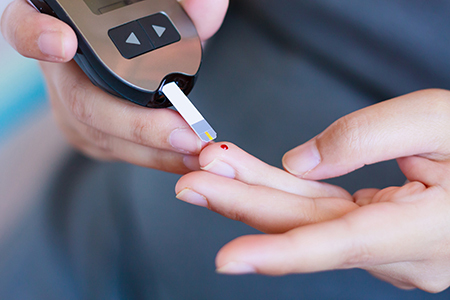 After eating a meal, blood sugar levels rise, and pancreatic β-cells should normally release insulin to manage the glucose present in the blood. However, to address the rising levels of blood sugar without the corresponding insulin hormone to take care of it, T1D patients inject insulin. They can monitor the effects of different meals through measuring their blood glucose levels manually through finger pricks or with the help of a continuous glucose monitor8. While continuous glucose monitors are extremely useful, it is also vital to understand how the body's blood sugar levels respond to certain meals, medications, physical exercise, and hormone fluctuations. Too little or too much insulin injected into a diabetic patient could result in either hypoglycemia or hyperglycemia, respectively. Stem cell-based therapies have been a focus of research for both T1D and T2D in recent years. Multiple types of stem cells are used depending on the situation: most commonly mesenchymal stem cells (MSCs), and sometimes induced pluripotent stem cells (iPSCs) and embryonic stem cells (ESCs). While ESCs are the most plastic of all the stem cell types, exhibiting extreme flexibility and pluripotency, they cannot be utilized for same-patient based therapies because they must be obtained from early stage blastocysts (pre-embryos). iPSCs present a solution to this specific problem, but require several weeks to produce cells with β-cell-like phenotypes and do not consistently replicate9. Many research groups make use of MSCs for this reason; they can be obtained from a patient's bone marrow, adipose tissue, molar cells — in infants from amniotic fluid or the umbilical cord — and can transform into certain other cell types. MSCs are fibroblast-like cells that can differentiate into mesenchymal lineages such as bone, fat, and Wharton's jelly (a gelatinous substance found in the umbilical cord)10. Additionally, studies in diabetic mice have shown that bone marrow-derived MSCs can be chemically induced to produce insulin and effectively lower blood sugar levels11. When β-cells in patients with T1D are destroyed, other co-located cells in pancreatic islets may be able to generate insulin instead. A collaboration of researchers recently published a study in Nature that mouse pancreatic α-cells can produce insulin in the absence of functioning β-cells. Both cell types are co-located in the pancreatic islets — also referred to as the islets of Langerhans. While α-cells usually produce the hormone glucagon, certain chemical additions can induce them to produce insulin instead. The technique used in this study is known as a cell-identity switch, where differentiated cells are converted to other cell types under specific conditions. In addition to α-cells, somatostatin-producing γ-cells can also produce insulin after the destruction of β-cells. Until now, this type of cellular switching has not been shown in human cells. This study is a proof-of-concept that pancreatic α- and γ-cells derived from diabetic human tissue samples can produce insulin when transplanted into diabetic mice. The insulin production continued even after six months throughout the study12. While this study is far from becoming a treatment, it is encouraging to many in the field that islet cells can be modulated to ease the symptoms in T1D. Stem cell-based therapies have entered into clinical trials, and while cell-switching is still in animal models, studies like the one mentioned above show great promise for the field of diabetes research. 1. Global report on diabetes. 2016. 2. G. Wilcox, Insulin and Insulin Resistance. Clin. Biochem. Rev. 26, 19-39 (2005). 3. B. T. Rodrigues, V. N. Vangaveti, U. H. Malabu, Prevalence and Risk Factors for Diabetic Lower Limb Amputation: A Clinic-Based Case Control Study. J. Diabetes Res. 2016, 5941957 (2016). 4. Mayo Clinic Staff, Type 2 diabetes. 5. Centers for Disease Control and Prevention, Type 2 Diabetes. 2018. 6. US Department of Health and Human Services, Diabetes and Pregnancy - Gestational Diabetes. 7. American Diabetes Association®, Insulin Routines. 8. Type 1 Diabetes Treatments. JDRF. 9. S. Konagaya, H. Iwata, Chemically defined conditions for long-term maintenance of pancreatic progenitors derived from human induced pluripotent stem cells. Sci. Rep. 9, 6-7 (2019). 10. J. Cho, M. D'Antuono, M. Glicksman, J. Wang, J. Jonklaas, A review of clinical trials: mesenchymal stem cell transplant therapy in type 1 and type 2 diabetes mellitus. Am. J. Stem Cells. 7, 82-93 (2018). 11. A. Kakkar et al., Current Status of Stem Cell Treatment for Type I Diabetes Mellitus. Tissue Eng. Regen. Med. 15, 699-709 (2018). 12. K. Furuyama et al., Diabetes relief in mice by glucose-sensing insulin-secreting human α-cells. Nat. 2019, 1 (2019).